A 48-year-old man with a history of recently diagnosed acute myelogenous leukemia (AML) presented to the emergency room with a one-month history of abdominal pain and bloating. He also reported a twenty-six pound weight loss. Review of systems was negative for fever, chills, or blood in his stools. Physical exam demonstrated jaundice but was otherwise unremarkable. Laboratory studies revealed elevated conjugated bilirubin, total bilirubin, alkaline phosphatase, gamma-glutamyl transpeptidase (GGT), aspartate aminotransferase (AST), and alanine transaminase (ALT). Amylase, and lipase were normal. 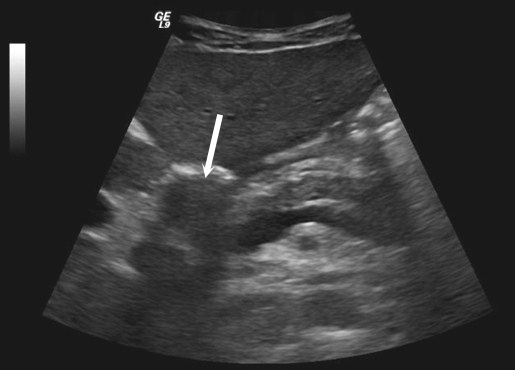 The patient then underwent an abdominal ultrasound followed by CT scan (Fig 1). Pancreatic mass with adenopathy and splenomegaly in a patient with AML. 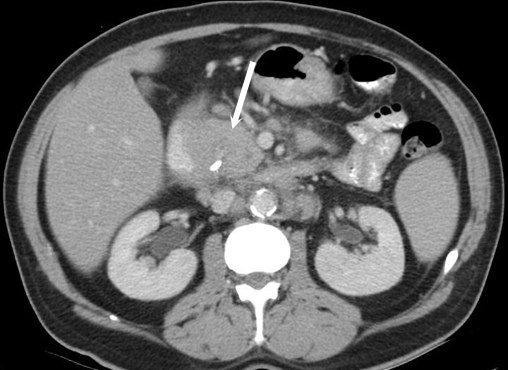 Pancreatic masses are relatively common in abdominal imaging. The most common etiologies are pancreatic adenocarcinoma and pancreatitis, which may simulate a discrete pancreatic mass when focal. Metastatic disease and neuroendocrine tumors are less common. Additional rare masses, such as granulocyte sarcoma, should be considered in unique clinical settings. Having a basic understanding of the imaging manifestations of these processes will assist in suggesting the correct diagnosis and guiding management and appropriate therapy. 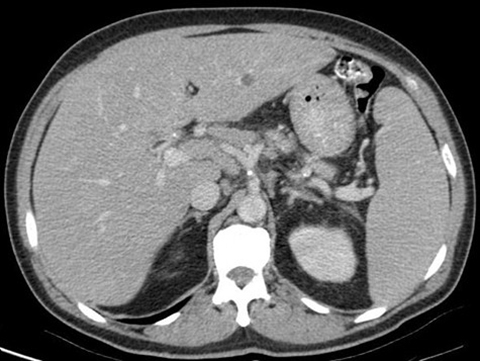 On CT, granulocyte sarcoma presents as a solid, contrast enhancing lesion with associated adenopathy and splenomegaly. These tumors are usually pliable and may result in biliary stasis. In a patient with recently diagnosed acute myelogenous leukemia and imaging features discussed above, granulocyte sarcoma is the leading diagnosis. The patient's described symptoms of abdominal pain and bloating are likely secondary to duodenal extrinsic compression. Adenocarcinoma is the most common primary neoplasm of the pancreas and most commonly involves the pancreatic head. This entity on CT presents as a solid mass. Adenocarcinoma usually produces significant mass effect, resulting in dilatation of the common bile duct and pancreatic duct (the double duct sign). It is not the favored diagnosis in this case given the presence of splenomegaly and absence of biliary ductal dilatation. In conclusion, it is important to consider granulocyte sarcoma when confronted with a pancreatic mass with associated abdominal adenopathy and splenomegaly in a patient with a known history of AML, especially in the absence of biliary ductal dilatation. Although rare, recognizing this diagnosis as a distinct possibility may assist the pathologist in making the correct diagnosis on biopsy specimens and facilitate appropriate chemotherapy treatment with improvement or resolution of tumor burden. Servin-Abad L, Caldera H, Cardenas R, Casillas J. Granulocytic sarcoma of the pancreas. A report of one case and review of the literature. Acta Haematol 2003;110(4):188-92. Ravandi-Kashani F, Estey E, Cortes J, Medeiros LJ, Giles FJ. Granulocytic sarcoma of the pancreas: a report of two cases and literature review. Clin Lab Haematol 1999 Jun;21(3):219-24. Choi EK, Ha HK, Park SH, et al. Granulocytic Sarcoma of Bowel: CT Findings. Radiology 2007; 243:752–759. Nishida H, Kinoshita T, Yashiro N, et al. MR findings of granulocytic sarcoma of the breasts. BJR 2006;79: e112–15. Byrd JC, Edenfield WJ, Shields DS. Extramedullary myeloid cell tumors in acute nonlymphocytic leukemia: A clinical review. J Clin Oncol 1995;13:1800–1816. Paydas S, Zorludemir S, Ergin M. Granulocytic sarcoma: 32 cases review of the literature. Leukemia and Lymphoma 2006; 47(12):2527-41. Chen J, Yanuck RR, Abbondanzo SL, et al. c-kit (CD 117) reactivity in extramedullary myeloid tumor/granulocytic sarcoma. Arch Pathol Lab Med 2001; 125:1448-52. Kim T, Murakami T, Takamura M, et al. Pancreatic Mass Due to Chronic Pancreatitis: Correlation of CT and MR Imaging Features with Pathologic Findings. AJR 2001;177: 367–371. To’o KJ, Raman SS, Yu NC, et al. Pancreatic and Peripancreatic Diseases Mimicking Primary Pancreatic Neoplasia. RadioGraphics 2005; 25:949–965. Horton KM, Hruban RH, Yeo C, et al. Multi–Detector Row CT of Pancreatic Islet Cell Tumors. RadioGraphics 2006; 26:453–464. Saenz RC. Pancreatic Mass . J Am Osteopath Coll Radiol. 2012;1(4):38-40.